Whenever you cast a noncreature spell, you pay pay 1U. If you do, put a 2/2 blue Djinn Monk creature token with flying onto the battlefield. Edited this deck from Dragon-Style: Fire and Ice into Dragon Sin of Wrath. Here's the list of changes I made. The cards I replaced were cards that I didn't really used and ended up slowing my fast tempo. Also I find that this deck's weakness is a Black White Removal deck. So in turn, I added more mana ramp with more removal. 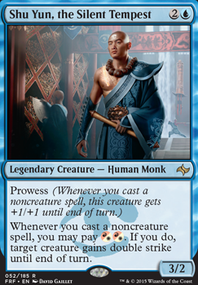 I don't know how much value you'd get out of Skywise Teachings, but it counts toward Sphere of Safety, triggers Taigam, Ojutai Master, and creates blockers for your Planeswalkers. You may also want Lightning Greaves for Azor's Elocutors; and "yes", you should include Inexorable Tide. Arvail on How lazy is wotc!! Are you not familiar with limited? Sometimes it's good for the draft environment for players to have access to a larger pool of a single card. 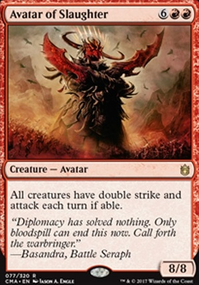 For example, the Khans block had lots of powerful bomb enchantments like the siege cycle, Mastery of the Unseen, etc. In addition, tons of removal in the format came in the form of enchantments (Encase in Ice, Pacifism, Silkwrap, etc. In addition, we've got powerful stuff like Skywise Teachings at uncommon. There's also a ton of artifact mana fixing available in the format. It absolutely makes sense for Naturalize to make two appearances across the block. In this way, someone in green doesn't have to stress about picking it up early because it's basically more of a sideboard card anyway, but you know you're going to come across one or two in your pool at later stages of the packs almost guaranteed. Repeat cards with different arts are also a great way to showcase change on the plane. Bxbx on B/U/G/W Toke Generators! @ Wyldemage: Thank you for the suggestions! I do, however, have reservations about each of these cards. If you think I'm wrong in my criticisms, by all means I would love to hear your thoughts on them more in-depth, but here are the issues I see. Skywise Teachings: This doesn't seem like a very good card to me. 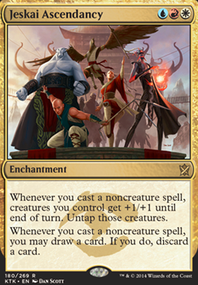 not only does it cost 4 to cast a card that does nothing on it's own (except count towards enchantments), but it takes another 2 every time you want to activate it, all for a single 2/2 creature with flying. Spot removal is cheaper than these chump blockers, and without mana ramp we rarely have lots of extra mana floating around. It really just seems far too slow, and too weak for its cost. Render Silent: I love this card, and have strongly considered adding it for flavor alone. However, three mana is a lot to hold up for a counterspell, and where we don't run many instants keeping mana up for it is hurting our board state progression a lot. 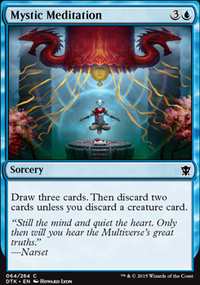 Plus, once this card does get played, an opponent can still cast any number of instants before it resolves. Again, this really seems to boil down to being too slow. I could see something like Silence, but this is in just the wrong spot on our curve. 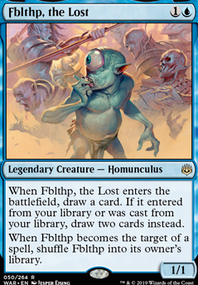 Dovin Baan: I might be able to see this one going in, though I have a hard time justifying what cards it might replace. Most of our high cost cards do more work, while our low cost cards are really important for staving off other decks until we get bigger pieces in play. I just can't see where this card would fit in without doing more harm than good. Mirage Mirror: This card seems interesting. It is another 3 drop, which is concerning given that this is already our peak for our mana curve. It also costs another 2 every time we use it, which isn't fun, but being able to briefly make extra copies of any of our permanents, OR our opponents? It could be good... but again, I just don't know what to remove. I'd also want a second opinion on this one, it feels like it could be a trap. Here are some enchantments I thought of.